By Frank Van Hess. Sung by Charles Morton. 'Twas in the merry month of May, a blue-eyed girl I met. She'd rosy cheeks, complexion fair, and a light-green parasol. Fit for an earl, I thought this girl with a light-green parasol. She made a curtsey, then I bowed-what man could do much less? Said I: "There's rain in yonder cloud, take shelter, charming miss." We both will find a shelter 'neath my light-green parasol.- Cho. So how a share can I refuse of my light-green parasol" - Chorus. I felt enraptured with her quite, so proffered her my hand. 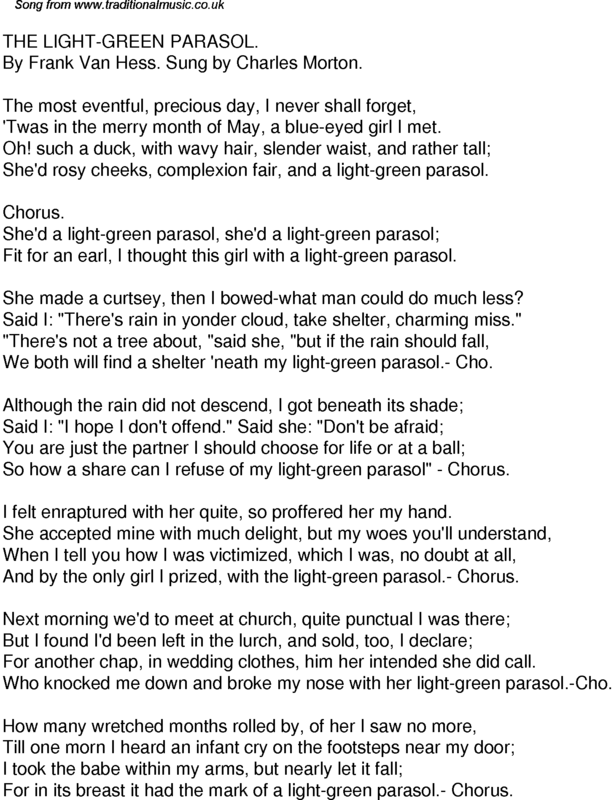 And by the only girl I prized, with the light-green parasol.- Chorus. For another chap, in wedding clothes, him her intended she did call. Who knocked me down and broke my nose with her light-green parasol.-Cho. For in its breast it had the mark of a light-green parasol.- Chorus.